Malaysia's property market is due to stay vibrant in 2010 due to low borrowing costs, easier foreign ownership rules and a new home purchase scheme by the nation's biggest pension fund. Last year, there was a 0.7 per cent drop in the total number of property transactions but the number of unsold properties fell by 13 per cent for residential units. "This shows that the property market in Malaysia is more resilient and stable, especially in demand locations such as in the Klang Valley," said Housing and Local Government Minister Datuk Wira Chor Chee Heung. He spoke at the opening of a three-day property fair organised by iProperty.com in Kuala Lumpur yesterday. The total number of property transactions dropped 0.7 per cent to 337,859 in 2009 from 340,240 in 2008. The bulk of it came from the housing market, making up 63 per cent of the total deals and 52 per cent in terms of value. "The total number of launches reduced only slightly from 48,830 units to 45,909 units in 2009, possibly due to some cautiousness among some developers. Selangor and Johor remains the leading states with 8,430 units and 7,099 units respectively," he said. Speaking to reporters later, Chor lauded the Employees Provident Fund's (EPF) latest move, which would boost the local housing industry. From August 1, EPF will launch a flexible withdrawal scheme for higher-end houses. The scheme is open to contributors who have not made withdrawals under the existing scheme to buy a house or reduce their housing loans. According to the EPF, the main difference of the new scheme is that it is designed to give qualifying members, who initially were not eligible for a higher loan, a better chance to boost their loan eligibility. MAMMOTH Empire Holdings Sdn Bhd expects to rake in RM350 million revenue a year from its newly opened Empire Shopping Gallery (ESG) in Subang Jaya, Selangor. The five-storey lifestyle and contemporary mall features 180 retail stores, with anchor tenants like Tangs, Fitness First Platinum and Jaya Grocer. ESG is part of the freehold Empire Subang commercial development, which includes the 10-storey, 210-unit Empire SoHo (small office/home office); 12-storey Empire Tower; and 13-storey, 199-room Empire Suites Hotel, a boutique hotel. The RM450 million development is located next to the KTM station. Datuk Sean Ng, managing director of Mammoth Empire, said that 90 per cent of the mall has been leased at between RM10 and RM25 a sq ft.
"We expect to lease the balance 10 per cent within the next two to three months. We are selective on the tenant mix as we want to maintain a certain quality," Ng told reporters after the official mall opening yesterday. Mammoth Empire group executive director Danny J.Y. Cheah said it was looking to build its hotel business. The Empire Suites Hotel is the first property to be managed and operated by the group. The group is also developing Empire Damansara in Damansara Perdana, Petaling Jaya, which will feature residential units, SoHo, retail shops, offices and a hotel. According to Cheah, Mammoth Empire is planning to launch an integrated development and a medium- to high-end gated residential project in Damansara Perdana by the year-end. The integrated development will comprise SoHo, an office and residential tower, and a third hotel for the group. Cheah said the master plan and value of the two projects are still being finalised. "We believe there is a good growth story in Damansara Perdana for hotel, commercial and retail (developments). Early this year, we launched Empire Damansara and it was fully sold in two months," he said. 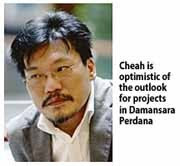 Cheah added that the group was talking to international operators to manage its hotels in Damansara Perdana. David Khor says Bangsar South City is changing the landscape of the area. The rapid development of Bangsar South City in Kampung Kerinchi by UOA Group is now changing the landscape of the area that used to be a slum with squatters. UOA Holdings Sdn Bhd general manager David Khor says the group is braving itself with the challenges and is optimistic of successfully developing the project within a few years. “We are trying to lift the image of Kampung Kerinchi and along the way, contribute back to the people here by providing new amenities, jobs and upgrading the access roads,” Khor tells StarBizWeek in an interview recently. The group, he says, is lucky in the sense that when it bought the land in 2005, the squatters had already been assisted by the Kuala Lumpur City Hall (DBKL) to be relocated to the nearby flats. “Our task that time was to help DBKL to revive the delayed flats and complete them within three months and we did,” he says. Spanning 60 acres with gross development value of RM4.5bil, the development of Bangsar South is set to be fully completed in the next five to seven years. “The plan is to have an equal 50:50 ratio of commercial and residential component. About 20% of the development is already completed,” he says. The development is called Bangsar South City because it shares the same postcode with Bangsar even though the location is in Kampung Kerinchi, says Khor. Khor says the group is now working together with Kampung Kerinchi residents, with the help from non-governmental organisations, to aid single mothers in need of assistance and provide tuition classes for children as part of its corporate social responsibility. “We want to uplift the image of Kampung Kerinchi to become the place of choice to live,” he says. In fact, Khor says this is why the name of Jalan Kerinchi is still used as the address of Bangsar South City. Before starting the development, Khor admitted that when the project was fully completed, traffic problems might arise as more people come to live and work. “The result showed that the access roads are still sustainable to handle traffic. However, we do have plans to build new access roads when the time comes,” he says. Touching on the outlook of property market last year and this year and its impact to the development, Khor says, despite the property market been affected by the economic crisis, the progress of Bangsar South City development has not been impacted at all and there are no delays. “We believe this year, the outlook will be more positive and promising. Our sales are doing well based on the responds we received for our residential and commercial properties,” he says. UOA is building grade A offices, retail avenues, boutique condominiums, service suites and a clubhouse. Two blocks of condominium called Acacia and Begonia which are now completed and enjoying 80% sales and in two months, the group will launch the service suites. On the commercial side, its boutique offices have attracted some of the prominent local and international companies. “The selling and rental rates for our residential and commercial properties are still competitive as compared to our neighbour, Bangsar, where the price for residential is around RM450 to RM500 per sq ft while the rental rate for our commercial side is around RM5.50 psf,” he says. Khor says most of the buyers for the residences are local, with many of them being UOA followers over the past 20 years. In January, Bangsar South City was awarded the MSC Malaysia Cybercentre status by the Government. The group is now able to attract more MSC-status companies and by 2013, they expect to host some 200 information and communications technology (ICT) companies. “Our focus is to become an important node in the local telehealth segment in collaboration with key figures in the health ICT industry,” Khor says. The group has established a 24/7 Cybercentre management office and a one stop centre on its journey to help create, nurture and grow a vigorous ICT in tandem with the MSC Malaysia agenda. Bangsar South City’s close proximity to Universiti Malaya also ensures availability of qualified graduates to man the demand of Bangsar South’s ICT tenants. Elaborating further, Khor says the group has set up The Advanced Informatics and Management Centre (AIMaC), aiming to pioneer and become a regional hub for growing eHealth industry, spurring concurrent local development and attracting/fostering local talents. “At the same time, we are supporting the green technology initiated by the Government by building more environmental friendly buildings that use less energy and planting more trees for a greener landscape,” he says. For the future plans for the group, Khor says they are looking to buy strategic lands with focus location in the Klang Valley to add up to their existing 100 acres of land banks. CRESCENDO Corp Bhd, a property developer based in Johor, plans to launch RM230 million of industrial properties over the next 18 months as improved economy and growing ties with Singapore help boost demand for its industrial properties. The company is also optimistic on its growth prospects over the next few years. "We believe this year will be better than last year," said managing director Gooi Seong Lim after Crescendo's annual general meeting in Petaling Jaya, Selangor, yesterday. The company, whose net profit grew for two consecutive years previously, saw its net profit declining 43 per cent for the year ended January 31 2010. Its industrial properties, under the Nusa Cemerlang Industrial Park (NCIP) project, were launched about two years ago. To date, it has launched 157 units of industrial properties with a gross development value of RM460 million. "So far, the response for our properties has been overwhelming. We have sold all the industrial properties that we built," Gooi said. The NCIP is still at the early stages of development. "So far, less than 100 acres of the 520 acres have been developed. We are still at Phase 1 of the development. I'm not sure when the NCIP will be fully developed as it is based on demand. But our past experience tells us it will likely take about 10 years for it to be fully developed," he said. The company is also planning to launch its Bandar Cemerlang township by the end of next year. Gooi said the decision to launch Bandar Cemerlang, a 1,390-acre mixed-development township, was mainly driven by two factors. One is the availability of key infrastructure such as an interchange that connects the township as well as the expansion of a highway there from two lanes to four. They are expected to be ready in the second half of 2011. The other factor relates to the supply issue, which Crescendo expects to taper off sometimes next year. Gooi said the company will remain focused on developing properties in Johor in the near term. "We have a landbank of more than 3,000 acres that should keep us busy for sometime," he said. The rising cost of living, especially for city dwellers, mean they now have lower disposable income and may need to watch their spending even more closely. Most Malaysians are trying their best to make ends meet. It is not uncommon these days to find folks juggling multiple jobs to feed their family. But despite the trying times, more houses and other consumer products are being sold. Strong domestic consumption is a good thing as it can contribute towards a more resilient economy. Prices of homes have escalated in the past one to 1½ years, and many people who have yet to buy their dream home are now in a quandary as they have to cough up at least 15% to 20% more due to the rise in house prices. Serious home buyers say it is becoming increasingly difficult to buy landed property in a relatively decent location that is priced between RM300,000 and RM500,000 – which is what the average buyer can afford. Buyers are somewhat bewildered that property prices have “gone through the roof” within such a relatively short time after the world’s worst financial crisis. Comments like the following are common, “Unless it is in a really secluded area, nothing is less than RM500,000 these days, even for a double-storey terrace house of just about 20 ft by 70 ft.” Even projects in the suburban and “further away” areas have shot up in prices. Good landed residential products, especially in mature neighbourhoods with readily available amenities and facilities, are hard to come by these days. Instead of building more high-rise residences that are already facing an over supply situation, developers should tweak their products wherever possible and offer more landed housing projects. This will be a good time for developers with sizeable land bank to move forward their project launches. Having the right product type is important as there are various needs to cater to. Instead of just offering houses that are of one standard size, developers should consider offering a wider range of built-up space to meet the different affordability levels of buyers. Inflationary pressure could be one of the reasons for the rise in property prices. Of course, market forces play an important role and the latest price hike shows that demand far surpasses supply. The appetite for house purchases can be attributed to growing confidence among buyers and investors that property is a tangible investment instrument that has proven to be more reliable than other forms of investments. The relatively sluggish equity market and low bank savings interest rates have also made property investment one of the more viable investment alternatives for Malaysians. While there are rich Malaysians who will not even bat their eyes over a RM1mil or higher price tag for a typical intermediate terrace house, more than half of the Malaysian population are not “in that league” yet. They have to turn to bank loans to finance their purchases and have to be prudent about their financial commitments. After all, buying a property is a big ticket item, more so with the appreciated prices. While it may sound good to belong to an exclusive residential community, such as a gated and guarded project in a sought after address, buyers have to be prudent and ensure they do not over commit themselves. The norm is to keep the maximum monthly loan repayment to about a third of one’s take home pay. Deputy news editor Angie Ng hopes developers will offer more “tailor made” housing products instead of the typical barrack-style houses that are being offered today. KUMPULAN Europlus Bhd (K-Euro) is banking on residential construction jobs from its associate Talam Corp Bhd for income while waiting for its two major projects - the Canal City and the West Coast Expressway (WEC) - to take off. The debt-laden firm hopes that its 26.51 per cent unit Talam, would be able to complete its stalled housing projects this year to be able to start selling houses in 2011. "This financial year we won't lose money," said the company's president and chief executive officer Tan Sri Chan Ah Chye. He said Talam has another 3,000 units of the total 13,000 units of stalled houses to finish by the end of this year. Talam which is undergoing a restructuring exercise plans to launch properties as much as RM1 billion by the second half of next year. "If there are no activities we are going to run at a loss again. So we are going to have activities," Chan told pressmen after the company's annual general meeting in Kuala Lumpur yesterday. Last year, K-Euro posted a net loss of RM33.1 million. In the first quarter ended April 30 2010, its net loss was RM3.4 million. Both the RM10 billion Canal City project and the RM3.5 billion West Coast Expressway has been snagged with delays. K-Euro is hoping to pen a supplementary agreement with the Selangor State Government soon to commence the Canal City project located near Kota Kemuning and Putra Heights in Selangor. K-Euro is still in negotiations with the the federal government to extend the WEC concession agreement and for changes to be made to the terms and conditions to ensure the project is fundable. IBRACO Bhd, a property group, has signed a conditional deal to buy 2.63ha of land in Kuching, Sarawak, from Datuk Wee Song Ching for RM16 million in shares. Wee, who now holds 4 per cent of Ibraco, will end up with 17.32 per cent of the group after completing the deal. Ibraco plans to build a shopping mall on the land for RM28 million and construction will start in August this year and finish in July 2011. It has a letter of intent from GCH (Malaysia) Sdn Bhd, operator of Giant Hypermarket, to become an anchor tenant for up to 30 years. LONDON: After marching to the same tune for the past decade, Britain’s property market and its economy are going separate ways, and further house price falls look likely into 2011 even if the recovery broadens. In the three months to June, Britain’s economy grew by 1.1%, its biggest quarterly bounce in four years. Yet UK house prices, which had become a major economic driver in the boom years, fell in every single month of that quarter according to the Halifax index. Whilst the economy is expected to continue growing, albeit modestly, the outlook for house prices is grim. Bank of England data on Thursday showed mortgage approvals slipped in June while lending recorded one of its weakest outturns in the series’ history. Historically, house prices and GDP growth have had a tight correlation because factors such as credit availability, wage growth and consumer confidence have tended to pull in the same direction. During the credit boom of the Noughties, that correlation was intensified by home owners borrowing and spending against the rising value of their homes. But things got out of whack in the spring of 2009 when recession prompted the Bank of England to unleash a wave of monetary stimulus and slash interest rates to 0.5%. The consequence was that mortgage affordability for those already on the property ladder rose to its highest in a generation, allowing prices to rise even though price/earnings ratios - the traditional valuation yardstick - were at uncomfortably high levels. While property prices and economic growth are likely to synchronise over the longer term, the divergence could persist over the next few years, particularly if interest rates rise. House prices in Britain began their rebound in the spring of 2009, when the country was mired in recession, and rose to within 10% of their late 2007 peak earlier this year. It is likely, however, that low interest rates have just have postponed an inevitable fall to more affordable levels. Simon Rubinsohn, chief economist at the Royal Institution of Chartered Surveyors, said the ending of the emergency stimulus measures posed a big risk for the property market. “The stronger the economy, the more likely it is that interest rates will rise and that transitional arrangements after the ending of liquidity support measures won’t be put in place,” he said. British banks need to refinance almost 800 billion pounds of short term funds by the end of 2012. This will sap their willingness to lend to homebuyers, particularly when prices are falling and capital buffers need to be rebuilt. At just over 166,000 pounds, the average price of a home is nearly seven times the average annual UK salary, well above the long term average multiple of 3.7. Record low interest rates have pushed the cost of servicing mortgage payments to its lowest in 35 years, according to the Council of Mortgage Lenders, but that is little comfort for first-time buyers unable to raise the chunky deposit lenders now require. Economists, almost all of whom were wrongfooted by the pace of the rebound last year, are growing increasingly bold in forecasting house price falls. Howard Archer at IHS Global Insight reckons prices will fall 3% to 5% in the second half of this year, with a further drop of 5% to 10% in 2011. UEM Land Holdings Bhd is launching phase one of Symphony Hills, a RM1 billion five-year residential project in Cyberjaya, and is confident demand will be strong. In fact, it expects to sell all 122 superlink houses, townhouses and town villas that will be launched this weekend. Prices range from RM1 million to as much as RM2.3 million per unit. Managing director Datuk Wan Abdullah Wan Ibrahim is optimistic of strong sales judging from the demand shown by both locals and expatriates in the Klang Valley, especially in Cyberjaya. "We feel Symphony Hills is hitting the market at the right time. There is Maju Expressway improving connectivity between Cyberjaya and Kuala Lumpur. "Cyberjaya has announced several new international firms coming on board. These include Fortune 500 companies, which will spur demand for new housing. Cyberjaya is going to fly," he said. Symphony Hills will feature 450 houses. The project will showcase the connected intelligent community (CIC) concept of state-of-the-art technology and high-speed fibre optic infrastructure. UEM Land is partnering Mesiniaga Bhd and Cisco Malaysia to develop Symphony Hills, which is the first residential development for the company outside of Nusajaya in Johor. Each house at the 98ha Symphony Hills will have strata landed status, allowing residents to maintain certain aspects of the project from landscaping to security. The project, which will be certified green, will also have a floating clubhouse incorporating green technology for rainwater harvesting. "Although the prices are steep, our margins are very mediocre. We won't get 30 per cent to 40 per cent margin, but the satisfaction will come from being the first developer here to offer such a community. "A lot of budget is being planned on the ICT (information and communications technology) component. We believe in value. We will make decent margins in the next few phases once we have delivered the first batch of houses," he said. UEM Land wants to buy more land in Cyberjaya, Kuala Lumpur, Penang and Kota Kinabalu to expand. Datuk Wan Abdullah Wan Ibrahim strikes a pose in front of a showhouse at Symphony Hills, UEM Land’s maiden project in Cyberjaya. CYBERJAYA: UEM Land Holdings Bhd, which will launch its maiden property project in the Klang Valley this weekend, expects “mediocre margins” from the 122 landed strata homes offered under the first phase of its high-end residential development, known as Symphony Hills, in Cyberjaya. Managing director and chief executive Datuk Wan Abdullah Wan Ibrahim said he was confident buyers would be willing to pay more for future launches at the site once the main components of the development were completed. “I managed to convince the board of directors that our margins will improve to a ‘decent’ level in upcoming launches after they (buyers) can see what we have delivered,” he told a media preview at the site yesterday. A number of UEM Land’s projects in Johor have won international acclaim and the company is setting a high target for Symphony Hills. Going forward, UEM Land will continue to expand its presence outside Johor. “We have a little war chest that we will use to acquire good landbank in several hotspots,’’ said Wan Abdullah. He identified these so-called hotspots as the Klang Valley, Selangor, Penang and Kota Kinabalu in Sabah. He said the group would only consider expanding overseas after 2012. Symphony Hills is located on a 98-acre site near Multimedia University. UEM Land plans to build 2,865 residential and commercial units with a gross development value of RM1bil over the next five to eight years. Only 410 landed homes are planned for this project, billed as the country’s first “connected intelligent community” development. “Symphony Hills was conceptualised under a strategic and intelligent masterplan that reinforces aspects of planning, design and technology. The concept combines the elements of comfort, convenience, community and security,’’ Wan Abdullah said. The first of the “intelligent” houses will sell for RM1mil to RM2.3mil each, or RM300 to more than RM400 per sq ft, depending on design, size and location. Wan Abdullah said a “floating pavillion” clubhouse within the development would be ready by the time the first batch of homeowners received their keys. To ensure the project would live up to its wired and connected billings, UEM Land has roped in network system provider Cisco and Mesiniaga Bhd as partners. UEM Land is the master developer of Nusajaya, Iskandar Malaysia in Johor, where it has 9,564 acres under various stage of development. The company is also a 25% shareholder in Setia Haruman Sdn Bhd, the master developer of Cyberjaya. Wan Abdullah credited the Maju Expressway, which significantly cut travel time between Cyberjaya and Kuala Lumpur city centre, as the key to Cyberjaya’s recent revival. “I believe we are hitting the market at the right time,” he said. The local property sector has not been affected much by the slowing foreign direct investment (FDI) last year and can cope with the pressure, Housing and Local Government Minister Datuk Wira Chor Chee Heung said. "All I can say is that the development of the housing industry in the country is very active. Although there is a reduction in FDI, we can still withstand (the pressure)," Chor told reporters on the sidelines of the 13th National Housing and Property Summit in Petaling Jaya, Selangor, yesterday. He was asked to comment on the United Nations Conference on Trade and Development report which said that FDI in Malaysia had plunged more than 80 per cent last year. Chor said that units offered at property launches in the Klang Valley, in particular, were quick to be taken up by buyers. "This is probably because Malaysians have high saving rates that enable them to buy these properties. "Added to this, the prices of properties in the country are still relatively low compared to neighbouring countries." Chor said foreign investors were still keen to participate in the property industry here as they were optimistic of opportunities to make profits. He said there were no worries at the moment that rising prices could lead to a property bubble, adding that the government had no plans to control prices. "There is no property bubble in the country as demand and supply is matched properly. There is no fear of a property bubble here. "We have not reached the stage yet and the mechanisms are right in place. It is still manageable," he said. Chor, who is also MCA vicepresident, criticised the DAP for publicly calling for the removal of the 5 per cent discount for Bumiputeras to buy luxury homes. "The MCA had discussed the idea of slashing Bumiputera discounts for luxury homes even before it was raised by DAP's PJ (Petaling Jaya) Utara MP (member of Parliament), Tony Pua, last week. "But we did not bring it up in public until a proper study and consultation is made. Unlike them, we just don't simply say anything that crosses our mind." Chor was responding to Pua's suggestion to the Selangor state government to remove Bumiputera discounts for luxury homes and commercial properties in the state to boost competitiveness and restore investor confidence. "We have to look at the statistics and discuss the matter thoroughly, including getting feedback from the Bumiputeras themselves," he said. Chor, however, said the MCA felt that it would be better if the rich Bumiputeras did not take the 5 per cent discount, but channelled that instead to help the poor Bumiputeras. SOME RM2.1 billion worth of residential properties in Penang are being lined up for development from this year to next, Chief Minister Lim Guan Eng said. He said that Penang and Kuala Lumpur-based developers were planning a total of 2,696 residential properties, with estimated gross sales of more than RM2.1 billion, on the island and mainland. "Of this, a total of 1,676 units with estimated gross sales value of RM1.84 billion are located out of the island," Lim said at a luncheon address on the sidelines of the 13th National Housing and Property Summit in Petaling Jaya, Selangor, yesterday. Apart from this, the state government will also put out to tender some of the prime land in Penang, he added. Among the sites is a piece of land between the Penang Bridge and Queensbay shopping complex. "This land is being offered on a freehold basis with the reserve minimum price of RM200 per sq ft. This is considered cheap. "However, potential bidders will be required to build a hospital, office lots, and reclaim some land. Still, this is a worthwhile bargain," Lim said. According to Lim, interest was already being shown by overseas investors, including those from Singapore and Hong Kong. Talam Corp Bhd, once the country's largest builder of low- and low-medium-cost houses, plans to launch properties worth as much as RM1 billion once its restructuring exercise is completed. The property launches will be staggered over a period of two to three years. The company expects to launch some projects by the second half of next year. The group has sold off RM676 million worth of properties to settle its debts, of which RM393 million is due to Menteri Besar Selangor Inc and RM266.3 million to lenders. When its restructuring is completed, the group's current liabilities will be reduced to RM190 million from RM887 million a year ago. "Once this exercise has been approved by shareholders and regulatory body, we will use the remaining landbank to launch higher-range products," executive director Chua Kim Lan told reporters after the group's annual general meeting in Kuala Lumpur yesterday. After selling off some 1,942.5ha to settle its debts, the group still has 809.4ha in Selangor and plans to develop bungalows, semi-detached houses and industrial factories. "One of the many things we learnt from this episode was, when we launch low-medium-cost houses, we get low returns. In addition to that, during the peak of the property market in the 1990s, we had a huge landbank of 7,284.3ha and the group's liability then was around RM4 billion to RM5 billion," chairman Tsen Keng Yam said. "We do not need so much landbank, should only buy when you have money and when you need it," he added. For this year, Talam is committed to finishing off its incomplete projects, including housing developments in Kinrara Section 3, Jalil Heights, in Petaling, Saujana Puchong and Ukay Perdana. The projects have progress balance billings of about RM100 million. The government is seeking "white knights" to revive 56 abandoned housing projects while coming down hard on directors of companies and property developers out to make a fast buck from the industry. Housing and Local Government Minister Datuk Wira Chor Chee Heung said its officers had managed to bring down the number of abandoned projects to 56 from 151 last year. "In the process of reviving these abandoned projects, we have identified 40 developers who are willing to help revive those projects. "Now, there are 56 projects that need to be revived, but we have yet to get the needed assistance from the willing developers," Chor told reporters at the 13th National Housing and Property Summit in Petaling Jaya, Selangor, yesterday. He said that some developers were not really interested in helping to revive the abandoned projects as they were not money-making ventures. On the contrary, they had to fork out more money to revive them. Taking this into account, the government is willing to top up the RM200 million fund allocated previously to revive such projects, he said. At the same time, the ministry will be stricter in vetting applications by developers for housing developments. "We try to weed out unscrupulous or unqualified developers who tend to make a fast buck. "Their actions are not wanted here. The buyers tend to be the victims as they have taken loans to pay for the houses in advance. If the projects are abandoned, they will suffer," Chor said. Although he did not have the statistics on errant developers, Chor said the ministry had blacklisted some, including company directors.These directors are not allowed to set up new companies. On calls for the government to implement the "build first, then sell" policy, Chor said that the country had yet to reach the stage to implement it, but encouraged able developers to do so. "When we build first, and up to a certain level, then sell, then, of course, developers will have to set aside a lot of capital outlay. "Currently, a lot of developers in this country can only continue development under the current system of acquiring funding from end-financiers. "I suppose we are not able to emulate advanced nations such as Singapore where they build first and sell later. "We have not reached that stage yet, but we encourage those who can afford to do that," he said. On the 10th Malaysia Plan (2011-2015), Chor said that some 78,000 units of affordable housing had been targeted to be built. "We are targeting to build 78,000 units although survey shows that there are currently some 95,000 families throughout the nation who have yet to own houses. He added that there was a lot of demand for such houses in Selangor, Penang, Pahang and Kedah. KUALA LUMPUR: MUTIARA GOODYEAR DEVELOPMENT Bhd announced that its wholly owned subsidiary, Potensi Naga Sdn Bhd (PNSB), has entered into a sale and purchase agreement (SPA) with Prosper Palm Oil Mill Sdn Bhd (PPOM) to dispose a property for RM38 million cash. The company said on Friday, July 30 that the property involved a 13-storey office building together with 230 car park bays in Kelana Centre Point, Petaling Jaya. The group said the property was acquired by PNSB on May 15, 1999 for a consideration of RM31.9 million, adding that it was a leasehold property with the lease expiring on Jan 23, 2094. "The property is currently leased to a mixed group of tenants for office use and has a tenancy rate of 77%," said Mutiara, adding that the approximate age of the property is 11 years. It noted the fair book value of the property based on PNSB’s latest audited financial statements for the year ended April 30, 2009 was RM32 million. Mutiara said the the disposal represented an opportunity for the Mutiara Group to unlock the value of assets that did not contribute towards its core business of property development. It added that the disposal would also free the group from future holding and maintenance costs of the property. The proceeds from the disposal would provide future cashflow for the group’s working capital purposes, reduce its borrowings and/or contribute towards expansion of its core business. The Empire Shopping Gallery (ESG), Subang Jaya's new landmark, expects its retail space to be fully taken up in three months' time. Mammoth Empire Holdings Sdn Bhd managing director Datuk Sean Ng said most of the company's projects had different concepts to prevent the customers from getting bored. "To meet the demands of the customers, we have been selective in the tenants we want. "We also actually have to look at the geographical and demographic factors in certain locations to implement the right concept," he told reporters after the opening of the lifestyle-focused and upscale mall in Subang Jaya today. The mall is part of the freehold Empire Subang commercial development which also comprises Empire Soho (small office/home office), Empire Tower and a boutique hotel. Empire Soho consists of 210 units while the Empire Tower is a 12-storey office block. Empire Hotel offers stylish getaway options for business and leisure travelers. Mammoth Empire Holdings Sdn Bhd also have two other projects at Damansara Perdana that will be launched by year-end. PETALING JAYA: The Kuala Lumpur office market is expected to remain soft for at least the next six months, with average rental rates facing downward pressure, including for some prime office buildings, property consultants said. DTZ Nawawi Tie Leung executive director Brian Koh said with the large incoming supply of new office space, especially in the next two years, office occupancy and rental would come under pressure until at least 2012. “It will take sometime for the market to recover. We expect monthly average rentals in the prime office areas to ease from RM6 per sq ft now to around RM5.80 in the coming months,” he told StarBiz. DTZ Nawawi Tie Leung, in its latest DTZ Property Times Kuala Lumpur report, said the local office market had increasingly become a tenants’ market as supply would continue to surpass demand. “This is due to a significant increase in incoming supply later this year and over the next few years. That will allow tenants to negotiate for cheaper rates upon renewal and when signing for new leases,” it added. By the second half of the year, another 2.06 million sq ft of new office space is scheduled to come onstream. Between 2010 and 2014, about 14.9 million sq ft of space is in the pipeline, with about seven million sq ft scheduled for completion in 2012. “With the significant supply of new office space coming on-stream, competition is expected to intensify further among new office buildings to secure tenants, and office rents are expected to see further downward pressure,” the report said. It added that the outlook for the sector remained cautious, “until a more convincing and firmer economic performance is achieved”. Although the overall occupancy rate of office buildings in Kuala Lumpur rose from 87.2% in the first quarter of this year (Q1’10) to 87.9% in Q2’10 due to a lack of new supply, the average monthly rental of office space fell from RM6.02 per sq ft (psf) in Q1’10 to RM6.00 in Q2’10. “It is still largely a tenants’ market with landlords offering better terms to tenants under growing competition from existing and newly completed office buildings,” it added. Lauding Bank Negara’s issuance of five new commercial banking licenses as “giving a boost to the office market”, it said demand for office space was essentially driven by employment generation in the services sector. The report pointed out that the capital value of real estate in the investment market was expected to remain stable this year. CB Richard Ellis Sdn Bhd executive director Paul Khong concurs that the market is very much a tenants’ market and rental rates are very competitive. “Landlords need to fight harder to attract tenants and various financial incentives are now thrown in to package a deal,” he said. “Over the next six months, we expect to see further activities in the office market and more relocation of tenants to newer buildings,” he added. Khong noted that the market held on rather well in the first half of the year with areas like KL Sentral, Jalan Bangsar, Mid Valley, Damansara Heights, Petaling Jaya and Mutiara Damansara, recording a higher occupancy rate. Monthly rentals for Grade A office space in KL’s city centre are within the range of RM6.50 to RM7 psf inclusive of service charges, at RM7.50 to RM8 psf in KLSentral, and RM5 to RM5.50 psf in Bangsar and Damansara Heights. 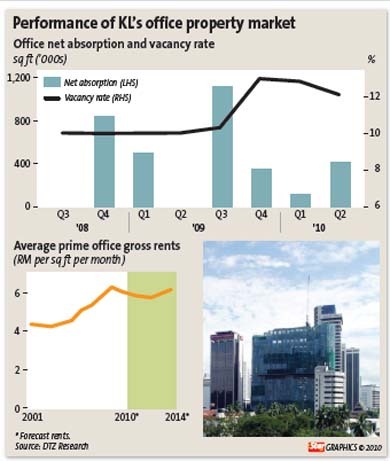 Average office rental in Petaling Jaya is around RM4.50 psf. Housing development in Malaysia is still active due to the rapid growth of urbanisation and is expected to increase from 67 per cent this year to 75 per cent by 2020. Housing and Local Government Minister Datuk Wira Chor Chee Heung said the property sector is doing well based on positive sales by property developers. "In my own personal opinion, the industry is doing well as Malaysians have a high savings rate and are still able to purchase houses," he told reporters after officiating the 13th National Housing and Property Summit in Kuala Lumpur today. The summit was organised by the Asian Strategy and Leadership Institute. 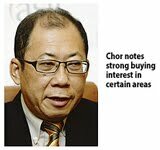 Chor said the growing demand for property was also in line with the rising population while prices of properties in Malaysia are still low compared to other regions. "Hence, the attractive prices have attracted foreign investors as they believe there is still an upside in terms of returns. The number of houses is projected to increase to 8.37 million units by 2020 from 5.15 million in 2000," he added. On whether rising property prices is healthy for the industry, Chor said the current pricing is still manageable and there was no overheating in the sector. "The government is monitoring the (prices) every now and then. We are not reaching the stage where there is going to be overheating," he explained. He also said Malaysia is not ready for the build and sell concept as the it has not achieved a specific level of development and is unable to emulate the advanced nations. However, he added, the Ministry of Housing and Local Government does encourage big developers to start the concept. "There are many developers at the top of the scale who are able to adopt the build and sell scheme, which of course, will not give rise to abandoned housing projects," he highlighted. According to Chor, the Housing and Local Government Ministry is in the process of reviving the remaining abandoned housing schemes and will try to weed out the unscrupulous developers. He said the government had successfully reduced abandoned housing projects to 56 this year from the 151 in 2009. KUALA LUMPUR: Penang-based Ivory Properties Group Bhd, which made a strong debut on the Main Market of Bursa Malaysia yesterday, hopes to expand its operations to Kuala Lumpur in the near future, said its chairman and group chief executive officer Datuk Low Eng Hock. 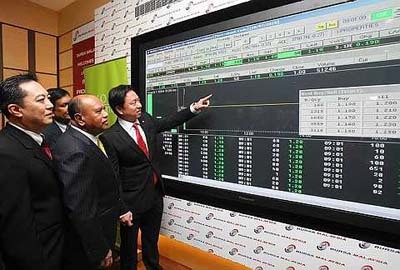 Datuk Low Eng Hock (right), deputy chairman Datuk Seri Nazir Ariff (second from right) and other directors checking out the company’s debut prices yesterday. “Our company’s strength lies in enhancing land value and maximising its return. We have been doing this in Penang for the past 10 years, and hopefully with the success of this listing we may secure deals with landowners in Kuala Lumpur soon,” said Low. The company posted a 15 sen premium over its offer price of RM1. Afternoon trade resulted in a high of RM1.35 before it closed 15 sen higher at RM1.30, with 51 million stocks changing hands. Ivory is the first property developer to be listed on the Main Market this year. Low said Ivory Properties was looking to secure joint ventures with other property developers. “We have been in joint venture deals with companies from Kuala Lumpur to develop property in Penang for the past 10 years. We are currently in talks with several companies to develop more townships as well as commercial condominiums,” added Low. At present, the company has completed property development projects with a total gross development value (GDV) of about RM675.63mil. It has ongoing projects with a GDV of about RM834.08mil scheduled for completion within the next few years. The company also has future projects worth RM1.9bil. Project director Murly Manokharan said the property market outlook was good at present. “In recent months, the property market has looked good not just in Penang but in the whole of Malaysia. We have recently participated in The Star Property Fair and sales results were better compared to the past two years. I would say the (property) market is on an uptrend,” said Manokharan. MRCB Sentral Properties Sdn Bhd, a unit of Malaysian Resources Corp Bhd (MRCB), will raise RM400 million of debt to finance the development of its latest project called KL Sentral Park. The commercial paper/medium term notes (CP/MTN) programme is arranged by Affin Investment Bank Bhd. "The financing, which is being guaranteed by Danajamin Nasional Bhd, is for a period of seven years," said MRCB chief executive officer Mohamed Razeek Hussain. KL Sentral Park comprises five blocks of office buildings, high-end retail shops, business centres and green spaces with a net lettable area of 518,000sq ft. So far, 18 per cent of the project has been completed. Speaking to reporters after the signing ceremony between MRCB, Affin Investment and Danajamin in Kuala Lumpur yesterday, Mohamed Razeek said construction started in the fourth of quarter of 2009. "The project is scheduled to be completed next year," he said. MRCB had executed a 15-year lease agreement with SME Corp and recently obtained a commitment to lease for 15 years by SBM (Malaysia) Sdn Bhd. "Collectively, this translates to occupancy reaching 60 per cent of KL Sentral Park's net lettable area," he said. Also present were Affin Investment managing director Maimoonah Mohamed Hussain, Danajamin chief executive officer Ahmad Zulqarnain Onn, Malaysian Trustees Bhd director Ng Hon Soon and MRCB senior vice-president of property Wong Dor Loke. Meanwhile, Maimoonah said the domestic bond market has been dull since the subprime crisis started. "Therefore, the guarantee provided by Danajamin to MRCB is instrumental to re-ignite interest by providing quality issuance to the market," she said. Maimoonah said the CP/MTN programme is accorded the highest rating of MARC1 and "AAA" with the guarantee wrap from Danajamin. This provides the most competitive pricing which lowers the company's interest costs further. The financing for MRCB is Affin's second for the group in the last two years, the first being the RM499 million syndicated loan. The four-storey Viva Home retail mall at Jalan Loke Yew, Kuala Lumpur, is set to change Cheras' landscape and spur new developments as well as improve the experience of shopping for your home. Viva Home is the first of its kind retail mall in Malaysia. It is a one-stop centre for home products like furniture, furnishing, home decoration and home improvement services. 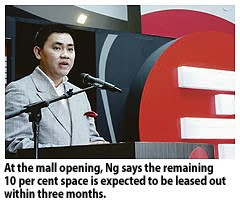 The 660,000-sq-ft mall, developed by Viva Mall Sdn Bhd, a unit of Kha Seng Corp Group, is opening by the end of this year. Besides shops catering to every inch of the home, the mall will also offer lifestyle and entertainment elements, housing anchor tenants like MBO Cinemas with nine screens and ICT Gadgets, an information and communication technology section selling computers, accessories, handheld devices and telecommunications equipment. There will be a range of food and beverage outlets, banks, a hypermarket and an exhibition hall, showcasing the latest home and home-related products and services. Viva Home will have lot sizes ranging from 300 sq ft to 2,000 sq ft, while anchors will have space of up to 15,000 sq ft.
All the lots are for lease, and Viva Home is currently undergoing its leasing campaign. "As a developer, we tend to look at long-term investment ... so we will retain the lots for recurring income and manage the retail mix," Viva Mall chief executive officer Yee Ia Howe said in an interview with Business Times. The lots will be leased from RM4 per sq ft, depending on size and location, which is the current market price, Yee said. Viva Home is part of a RM280 million two-phase redevelopment of Plaza Uncang Emas (UE3), which Kha Seng bought last year for some RM100 million. The old mall at UE3 is being refurbished and renamed Viva Home. The phase two of the development will boast a 260-room business-class hotel, which will sit atop the mall. Yee said work on the hotel will start by the end of this year. "We believe in this project. We did a lot of research on how it will work. We are improving the access to Jalan Loke Yew and Jalan Cheras and building a pedestrian bridge from the Taman Miharja light rail transit station into the mall," he said. Yee added that there will be clear merchandising zoning to ensure identifiable retail zones and concepts to make shopping easier and comfortable. Viva Home will also have 2,000 parking bays. INDUSTRIAL packager KYM Holdings Bhd, which owns a small property division, plans to bolster the business in a bigger way to create a new significant revenue stream. KYM executive director Datuk Lim Kheng Yew said the company owns some 28ha of land in Teluk Rubiah, Perak, and it plans to build properties there. "Property will be a new revenue stream for us to augment our income. We are working on that but haven't signed on anything at the moment," Lim said after its annual general meeting in Kuala Lumpur yesterday. Lim declined to elaborate when asked if KYM plans to become a full-fledged property developer and said "We will announce our plans in the foreseeable future." 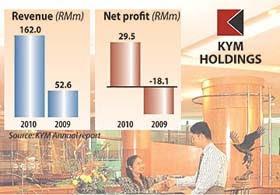 KYM made a windfall when it sold 163.6ha of its land to Brazil's Vale, an iron ore group, for RM101.9 million in June 2009. It has an option to sell another 302.4ha for RM93.8 million and this was completed in February 2010. As a result, KYM was able to cut its debt to RM50 million from RM180 million. KYM has also bought an additional 16ha of land in Jelapang, Perak, from Idaman Bina Makmur Sdn Bhd for RM12 million. The company hopes to participate in Vale's downstream activities in Teluk Rubiah. This could include building properties or being a distributor for Vale. KYM now makes and sells paper and polypropylene-based packaging products like fertiliser bags and carton packs. The Kha Seng Group, a niche retail property developer, has taken over Plaza Uncang Emas (UE3) at Jalan Loke Yew, Kuala Lumpur, and is turning it into a prime spot for retailers and consumers. UE3 is undergoing a massive redevelopment. The RM280 million plan includes turning the existing mall into a niche home retail mall, dubbed Viva Home, and building a multi-storey business hotel above it. Taking over such buildings is not new to Kha Seng. In 2004, it bought Central Market, located near the Klang bus station, from Melewar Group and turned it into a vibrant culture and arts centre. Kha Seng paid RM38 million for the building's remaining 60-year lease in an open tender by Pengurusan Danaharta Nasional Bhd. The decision to take on the project lies in founder Bernard Bong's passion for retail. His main focus is in taking over a building and finding loopholes to meet the demand and supply of end-retail consumers. "Central Market and Viva Home are strong concepts that can benefit from proper planning and surveying to uncover what the market really wants," he said. "It is our commitment to develop innovative, retail properties in the Klang Valley. We find there is a demand for them. We have more projects in the pipeline," Bong said in a recent interview with Business Times. Kha Seng is currently developing the RM1 billion Kenanga Wholesale City (KWC) in Kuala Lumpur at Jalan Kenanga, off Loke Yew, which will open by mid-2011. The 22-level KWC, with 500,000 sq ft of net lettable space, is set to be the flagship for the Malaysian fashion wholesale industry. The Jalan Kenanga area is the existing hub for Malaysian fashion wholesalers. Some RM1 billion revenue is generated per year and this is expected to increase by threefold after KWC opens, Bong said. The Kha Seng Group started as a garment manufacturer and wholesaler in the 1980s. It diversified into property development and investment some 15 years ago to ride on the growing retail market. Mohamed Razeek Hussain exchanging documents with Maimoonah Mohamed Hussain. With them are MRCB senior vice-president and head of property Wong Dor Loke (left) and Danajamin Nasional Bhd CEO Ahmad Zulqarnain Onn. KUALA LUMPUR: Malaysian Resources Corp Bhd (MRCB) will consider injecting some of its properties into a real estate investment trust (REIT) as part of the company’s growth strategy, said chief executive officer Mohamed Razeek Hussain. “REIT has never been (far) away from our minds. It is a strategy that we might employ in the future, perhaps in the mid to long term. “We are strengthening our balance sheet to enhance recurring income. When it is substantial and the time is right, we will consider,” he said after an agreement signing between MRCB and Affin Investment Bank Bhd yesterday. Razeek was responding to a research report earlier this month that MRCB was gearing up for a REIT. “For us, mid term would mean (within) three years and long term (is anything) beyond that,” he said. Meanwhile, MRCB plans to raise RM400mil via a guaranteed commercial paper/medium-term note (CP/MTN) programme. This is to finance its mixed commercial development, KL Sentral Park, which is valued at RM600mil. 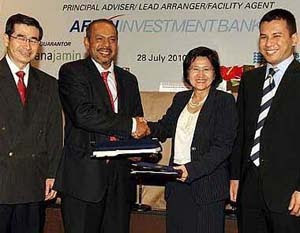 MRCB Sentral Properties Sdn Bhd, a wholly-owned unit of MRCB, has appointed Affin Investment to act as principal adviser and lead arranger for the programme, which will be guaranteed by Danajamin Nasional Bhd. The financial arrangement would come with an option of both floating and fixed interest rates, said Affin Investment managing director Maimoonah Mohamed Hussain. “The MTN allows fixed-rate funding wherein MRCB can lock in the current low rates of interest, given the environment where interest rates are trending upwards. Razeek said the first tranche, worth some RM50mil, would be issued “as soon as possible”. “For future tranches, it’s up to us to draw down whenever we want,” he said. KL Sentral Park, which is about 18% completed, is scheduled for completion next year. The project will comprise five blocks of office buildings, retail shops, business centres and green spaces with a net lettable are of about 518,000 sq ft.
CYBERJAYA: UEM Land Holdings Bhd, which will launch its maiden property project in the Klang Valley this weekend, expects “mediocre margins” from the 122 units on landed strata homes offered under the first phase of its high-end residential development known as Symphony Hills in Cyberjaya. Managing director and chief executive Datuk Wan Abdullah Wan Ibrahim said he is confident buyers would be willing to pay more for future launches at the site, once the main components of the development were completed. “I have managed to convince the board of directors that our margins will improve to a decent level in upcoming launches after they can see what we have delivered,” he told a media preview at the site today. A number of UEM Land’s project in Johor had already won international acclaims, and the company is setting a high target for Symphony Hills in Cyberjaya. A performing arts centre to rival Australia's Sydney Opera House, waterfront retail promenade and an international standard marina are among the attractions property developer IJM Land Bhd will unveil when it launches the second phase of its flagship waterfront "The Light" development in Penang at the end of the year. Its managing director Datuk Soam Heng Choon yesterday said the proposed iconic arts centre, known as "The Pearl" is expected to boost a seating capacity of 2,000 and set to be sprawled over 0.8ha. The proposed marina, meanwhile, is expected to offer club facilities with more than 200 berths. "Also to be found in the second phase of this commercial development would be an information technology precinct for Multimedia Super Corridor-status companies and incubator firms," he said during a media launch of the company's "The Light Collection 1" in Penang. 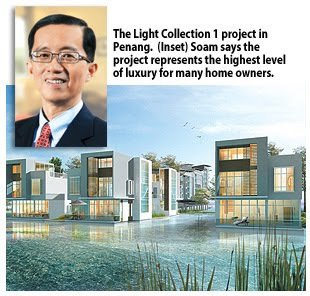 The Light Collection 1 project, which carries a development value of RM203 million, was soft-launched in May, and Soam said half of non-Bumiputera units which are sprawled on 2.8ha have been sold so far. Present at the launching ceremony were IJM Land general manager (north) Toh Chin Leong and one of the company's consultant architect, Eric Tham. The Light Collection 1 is the first of four in The Light Collection series which offers 24 units of four-storey water villas and 152 condominiums in four eight-storey blocks. While the condominiums have built-ups of 1,371 to 1,582 sq ft, the water villas, which are touted to be the first of its kind in the country, are set to boost a built-up area of 3,132 sq ft. The units are priced from RM823,600 to RM3.18 million. With a gross development value of RM5.5 billion, The Light is a 60.8-ha freehold waterfront development which will be built over the next 12 to 15 years. Soam said IJM Land intends to make The Light one of the best waterfront places to live in Malaysia. "Living by the water," he noted, "represents the highest level of luxury for many home owners." The entire The Light development is undertaken by IJM Land's subsidiary, Jelutong Development Sdn Bhd. The project, which will be carried out in three phases, is being touted as the biggest and best integrated residential, shopping, dining, recreational and commercial waterfront living in the northern region. Property developer Mutiara Goodyear Development Bhd is confident to maintain its dividend payment trend despite the adoption of Issues Committee (IC) Interpretation 15 Agreements. "We welcome the early adoption of IC Interpretation 15 as it streamlines and simplifies revenue recognition," Executive Chairman Hamidon Abdullah said in a statement today. IC Interpretation 15 dictates that revenue recognition from property development activities will be recognised only upon full completion of projects. Hamidon said that in the company's development profile, its focus was more towards cashflow management, development cycle time and profitability margin. "We are confident to maintain our dividend payment trend by capitalising on the company’s established profile and the market potential moving forward. Our shareholders will see a sustained dividend payout backed by sufficient cashflow and our strong financial position," he added. Mutiara Goodyear recently announced a dividend payout of 3.5 sen for the financial year ended 2010, representing an increase of 14.0 per cent as compared to the preceding financial years. Hamidon said the company's Prima Avenue at Dataran Prima would be due for completion by the fourth quarter of 2010 and would positively contribute to its cashflow in the 2011 financial year. "We are also strongly encouraged by the overwhelming response for Nadayu Melawati phase one which already achieved 80 per cent take-up rate at soft launch stage. "We also have a pipeline of launches over the next few years in the Klang Valley and Penang which will continue to provide us with a consistent cashflow stream," he added. With a vast track record of 35 years in the industry, Mutiara Goodyear has vast experience with various types of commercial and residential developments such as condominiums, link-houses, semi-detached, bungalows, shop offices and townships. Its notable projects include Subang Perdana new town, Bandar Tasek Mutiara township in Penang, Lagenda Mas in Cheras and Dataran Prima Condominium. KUALA LUMPUR: The two major real estate investment trusts (REITs) listed on Bursa Malaysia this month - Sunway Real Estate Investment Trust (SunREIT) and CapitaMalls Malaysia Trust (CMMT), may have boosted the profile of Malaysian REITs (MREITs) and capture the attention of local and foreign investors, but size does not necessarily guarantee a better performance going forward, analysts said. ECM Libra Capital Sdn Bhd research head Bernard Ching said while the REITs listed this year signified the maturing of MREITs and had managed to attract greater foreign investor participation, the performance of a trust would be dependent more on the REIT managers’ capabilities and the quality of the underlying assets injected into the REIT. Ching said in Malaysia especially, “mega” REIT managers generally have a tough time looking for quality assets large enough to be injected into the trust, despite having greater liquidity, compared to niche and smaller REIT players. “But the larger REITs would be more on the radar of foreign fund managers because of their sheer size and visibility,” he said. Ching said that while Malaysian investors have grown in awareness over the years in terms of investor knowledge and interest in REITs investment, the numbers were still relatively small. This despite MREITs giving two to three times better returns, compared with fixed deposit rates. “Many of the MREITs are currently giving 7% to 8% in income distribution yield,” he noted. A foreign REIT expert based in Singapore concurred with Ching that size was not the only factor to better performance for REITs. He said despite larger REITs listed on the stock exchange, MREITs were still at the infancy stage but that they were going in the right direction. “There are still many outstanding issues that have impeded MREITs’ growth, ranging from regulatory restrictions to the lack of tax incentives for REITs players, and commercial properties in prime locations that are difficult to be placed in a trust because they don’t have strata titles and a lack of quality REIT experts and advisors to these trusts,” he said. The foreign REIT expert said there was still a lack of conviction and confidence among Malaysian investors and even some foreign investors to invest in MREITs. On the SunREIT and CMMT listing, he said the reception from local investors to the REITs were generally lukewarm, considering that both were reputable and had a good pipline of properties ready to be injected into the trusts. “It’s still too early to tell how they will perform but they just about have it all ... the management expertise, size, and liquity to perform well, However, is there a market demand locally for these REITs?” he said. SunREIT closed at 91 sen yesterday, which was a one sen premium over its offer price of 90 sen when it was listed on July 8. 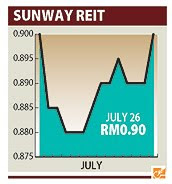 CMMT settled at RM1.01, up one sen from its reference price of RM1 when it was listed on July 16. BERJAYA Land Bhd (BLand) will launch new projects worth more than RM500 million this year to take advantage of pent-up demand for housing in the Klang Valley. 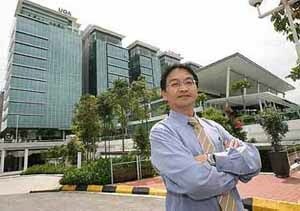 BLand is bullish on the property market, its senior general manager of properties and marketing, Mah Siew Wan, said. "We are seeing a return of buying interest for high-end houses. 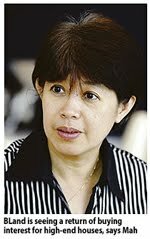 Our properties are all unique and in prime areas so we are confident of brisk sales," she told Business Times in an interview. BLand, 53 per cent controlled by Tan Sri Vincent Tan's Berjaya Corp Bhd, will launch Vastana25, a high-end project, at Seputeh Heights in Kuala Lumpur by end-July. Last weekend, it relaunched The Peak at Taman TAR in Selangor. The Peak, comprising 88 guarded and gated bungalow lots, was re-launched as it now has freehold status. By the end of this year, BLand will launch KM1 Condominiun in Bukit Jalil and shop offices in Berjaya Park in Shah Alam, Selangor. The group has about 10 ongoing developments worth some RM1 billion and it will launch more projects next year, Mah said. BLand has some 400ha in the Klang Valley with the potential of generating more than RM8 billion in gross development value. It also has projects in China, Vietnam and South Korea worth more than US$12 billion (RM 38.4 billion). In China, BLand has a mixed-development project comprising retail, entertainment, theme park and water park in Sanhe City, Hebei Province. It has yet to launch the project. Infrastructure work on its maiden US$3 billion (RM9.6 billion) resort-type mixed-development township project in South Korea has started. The project featuring apartments, serviced residences, semi-detached and resort-style villas, a wellness resort, a casino and resort hotel, hotel residences, a mall and an indoor arena will be launched next year. In Vietnam, BLand has a US$6.3 billion (RM20.7 billion) mixed-development project in Dong Nai Province. The furore over the proposed demolition of Pudu Jail puzzles me. Very few cities have old dilapidated prisons smack right in city centres. Even "The Rock" which is the infamous Alcatraz is on an island of the US west coast, and was initially the first lighthouse and US Fort. Later, it became a federal jail but it is on an island and not in the city centre of San Francisco. The closure and the proposed redevelopment of Pudu Jail highlights the Government's intention to rebrand Kuala Lumpur as a vibrant city with a new look. So far, we have seen announcements of government companies and government-linked companies being called upon to develop the Merdeka Stadium, the land at Imbi Road, Sg. Besi airport, the Matrade-Naza joint venture and EPF with the Rubber Institute of Malaysia (RRIM) redevelopment. While the RRIM development is at the fringes of Kuala Lumpur, the other sites are in the city, and the infrastructure to develop them will see a total change in the traffic flow, logistics of land use, and as a result, will provide for the first time alternative iconic centres to the 15-year old Petronas Twin Towers. The idea of using government companies looks like the early Singaporean model started by their first prime minister where they identified a piece of land at the end of Orchard Road, master-planned it and invited leading Hong Kong tycoons such as Lee Kah Shing and Tan Sri Frank Tsao to develop what eventually became the 5 million sq ft Suntec City which served as a catalyst for the redevelopment of the entire Marina Bay area. Singapore hopes to replicate that by opening up the new Marina Bay development where the very expensive Sail Condo is located right across from the Sands Casino. This is expected to be the new financial centre in Singapore, thereby creating an extraordinary new chapter as a regional financial centre. Malaysia should not play second fiddle, and we certainly have more opportunities to develop more iconic platforms as we have a better foot print and better design features. Furthermore, we have more land, and are able to spread our designs over a larger base. The task for the GLCs or government companies to design and master-plan certainly is a much better proposition than passing it to well-connected individuals as was previously the case. These wholly-owned government companies, run by highly trained professionals, are very conscious of the responsibilities they have been entrusted and fully understand that they are constantly and continuously being watched, analysed and monitored by very critical analysts. The government expects these companies to practice full transparency and accountability for the future success of these projects, and more importantly, expects them perform as intended, in accordance with world standards. Additionally, the benefits derived from these development projects will return to the people via the Government which is the sole owner of these government companies. Obviously the scale of the projects requires not only massive funding, but also deft master-planning and an understanding of market forces so that all these projects do not flood the market at the same time. Not many private companies are capable of handling these mammoth tasks. The fact that they have a single sovereign owner should also ensure that the release of these projects into the market place will be orderly, unlike previously where there was no adequate property information. Every private developer placed his project in a vacuum, assuming that he had no competition which resulted in over-supply and a drastic drop of capital values in the late 90's. We already have such a successful model in KLCC. The Sentral development project, after a rocky start at the tail end of the 1997 crisis, is now going from strength to strength, and MRCB has a good model there. While it is vital to inject private sector participation in these projects, it is more important to have wholly government-owned companies or GLCs to take the lead role in the master planning process. Selling these properties to the highest bidder, local or foreign, may result in the risk of the land being lost if the project failed or the purchaser, in his urgency to get the returns of his investment, fast-track the project without due consideration to market needs. Under this scenario, the project is bound to suffer. The most famous landmark failure of that is of Canary Wharf, the iconic Eastern Docklands of London, which was bought by the Reichmann Brothers of Canada. Their company, Olympia & York, became the most successful property developer in Canada and US before they ventured into bidding a high price for the Canary Wharf site in 1986. The 33.58ha site in 1987 became the largest development project in the world which incorporated One Canada Square, Britain's tallest skyscraper. With the UK running into recession in early 1990, the building remained empty and the Reichmann Brothers were declared bankrupt in 1992, owing debts in the amount of US$20 billion (RM64 billion). The banks then took over Canary wharf and sold it by auction years later. The London property market survived that disaster due to its strength as a world financial centre. If we follow that privatisation path again we may not be so lucky. Property developers in Johor want the Government to engage them in the consultation for and drafting of a plan to transform Johor Baru into a vibrant city. Real Estate and Housing Developers’ Association (Rehda) chairman of Johor branch, Simon Heng, says the private sector should not be left out in the drawing up of the plan although the initiative was mooted by the Federal and Johor Governments. “It will be good for all stakeholders if both the public and private sectors could work together to ensure the success of the project,’’ he says in an interview with StarBizWeek. Heng urges the Johor government to open up state-owned land in the city centre for redevelopment projects via the open tender system instead of awarding the parcels directly to certain parties. He says it is only logical to engage property developers as they are responsive to the market and know what products sell and what buyers want. “The former sites of the Lumba Kuda and Bukit Chagar low-cost flats are the best areas to build high-rise condominiums and serviced apartments. “These properties will attract Malaysian professionals working in Singapore and expatriates based in the republic due to the close proximity,” he adds. Heng says the number of Singaporeans renting houses in Johor Baru has risen in recent months because of the high rentals in the city-state. Most of these people commute daily from Johor Baru to work on the island. Prime Minister Datuk Seri Najib Tun Razak had last month announced that the Government would allocate funding to rehabilitate and transform Johor Baru. his include RM200mil to clean up Sungai Segget, one of the dirtiest rivers in the country. Sungai Segget flows along Jalan Wong Ah Fook in the city centre. Several years ago, RM6mil was spent to cover up a stretch of the river, which has a reputation for being a dumping ground for raw sewage. The money for the proposed Johor Baru project comes from the Federal Government’s facilitating fund while the Iskandar Regional Development Authority (Irda) will act as a facilitator together with the State Economic Planning Unit (Upen). According to Irda chief executive officer Ismail Ibrahim, Irda and Upen have until the end of this year to conduct studies to determine how the plan should look like. The findings are to be submitted to the Federal Government. Undoubtedly, it is vital to rejuvenate Johor Baru city centre, in line with its status as one of the five flagship development zones in Iskandar Malaysia. “Apart from engaging developers, views from property owners, non-governmental organisations, experts in town planning and chambers of commerce should be taken into account,’’ says Heng. SP Setia Bhd executive vice-president (property division, northern and southern regions) Datuk Chang Khim Wah agrees with Heng. He says the redevelopment plan will definitely increase the value of properties in areas near the city. These include those in Taman Pelangi, Taman Abad, Taman Sentosa and Taman Sri Tebrau. Chang says while Johor Baru should have its own identity, the stakeholders can always look at the success stories of city-centre redevelopment in other parts of the world. “A vibrant city should be a blend of the old and new, and a city should be a lively place not only during the day but also at night,’’ he says. Chang says Istanbul is a good example as the city, with historical sites and monuments, blends well with its chic Taksim Square. He says Johor Baru should have enough attractions to lure crowds back to the city centre even after office hours and during weekends. These can be done by having street performances, building specialty stores and boutique hotels in the old parts of the city, and by reopening the Ungku Puan night outdoor hawker centre. The centre, which was the biggest alfresco dining area in the city centre, was highly popular with locals and tourists but was closed several years ago; instead, ugly concrete kiosks have been put up there. KSL Holdings Bhd executive director Ku Hwa Seng suggests the authorities re-zone certain parts of the old housing estates near the city centre as part of the transformation plan. He says residential properties facing the main roads in these estates could be converted into food and beverage outlets and specialty retail stores like in Bangsar, Kuala Lumpur. Ku says developers should be allowed to buy these houses, refurbish and upgrade them, and lease these properties to restaurant and store owners. “Concerted efforts are needed from the relevant parties to ensure the success of the plan. But the most important thing is the political will of the state government,’’ he says. 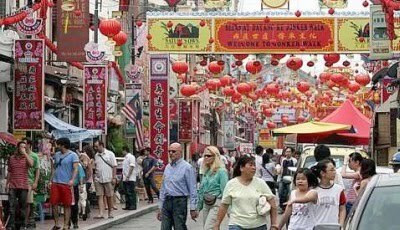 The Malacca government has turned the once old and quiet Jonker Street into the now vibrant and ‘happening’ Jonker Walk. The saying ‘Old is Gold’ certainly holds true for many things. Among the things that appreciate over time are family relationships, friendships and the value of some tangible things like real estate. Many so-called “city folks” in Kuala Lumpur and Petaling Jaya actually do not hail from the city; their hometowns are in other parts of the country. Home is where the heart is and many of us have set up homes in places where we work, after settling down with our own family, and have children attending schools or colleges in the city. With passing time and wisdom, we learn to appreciate our loved ones better. And despite the “rat race” of city life, it is important to stay connected with our loved ones and old friends back in the kampung or in other places. Likewise in the built environment, we can find many undiscovered gems around, which, in spite of their old physical exterior, are actually hidden treasures with strong history and many untold stories within their walls. The first thing that comes to mind is the many pre-war houses and buildings that can be found in large numbers in the inner cities of Penang and Malacca. Despite being old and dilapidated, many have the potential to be restored and given a new lease of life. Some of the ways to reuse these buildings and “monetise” them include turning them into museums, heritage hotels, alfresco dining and restaurants specialising in local fares. It is interesting to compare Penang and Malacca as they share many similar traits and history. Both will benefit by learning from each other new ways to improve and manage their built and unbuilt environment. Since my other half is a Malaccan, I must admit that I tend to compare my hometown, Penang’s George Town, with Malacca whenever I’m back for holidays or family events. After all, both have been declared Unesco World Heritage Sites and have many interesting buildings and structures that are reminiscent of their rich history and heritage. Penang and Malacca are both former Straits Settlement states with a long history of early settlers from various parts of the world converging there for trade. And both are renowned for their Baba/Nyonya culture and heritage. Being port states, both also have strong foreign connection and influence. Penang was a bastion of trade for the English and the East India Company after it was founded by Captain Francis Light in 1786, while Malacca was a confluence of Portuguese, Dutch and English influence. Those influences can still be clearly seen in the architecture of the buildings today. It is evident that both Penang and Malacca have their own distinctive assets and attractions that have endeared them to many loyal visitors who throng the cities in droves whenever there is a long stretch of holidays. This could be one of the reasons for the traffic-choked roads during the holiday season and major festivities. It is common to find many outstation cars among the long lines of cars on the roads during such times. To give a boost to their intrinsic value as natural tourist attractions, there is a need to improve the public transport system in the two heritage cities to ensure that the different modes of transport are well integrated and connected to each other. Being on the radar screen of tourists is one thing, but it is equally important to ensure that visitors have convenient access to a good public transport network. More should also be done to further boost the alluring old world charms of these cities while at the same time, revitalise the inner cities and keep them alive as living heritage. To achieve this, the old and new attractions and facilities should co-exist and blend seamlessly with one another to make them relevant and refreshing to the people. Malacca has made some interesting headway in this regard with many old buildings and “once quiet” historical enclaves being given a new lease of life. One just needs to hop over to the happening and vibrant Jonker Walk, which comes alive every evening, teeming with traders and visitors. Penangites can certainly take a leaf from their Malaccan counterparts to liven up George Town’s dilapidated inner city. Deputy news editor Angie Ng is keeping her fingers crossed that the old and new charms of our cities will be the pride of our present and future generations.